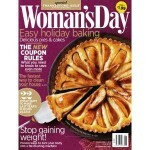 $5 For 1-Year Woman's Day Magazine Subscription on Amazon.com | A Savings WOW! Are you having a hard time finding a gift for someone on your holiday list? Magazine subscriptions are the gifts that keep on giving throughout the year. Right now, you can find some amazing deals on magazine subscriptions on Amazon.com. One of our favorite magazines is Woman’s Day because it includes tips for everyday life, recipes, and most of all, COUPONS! Get a one-year subscription to Woman’s Day magazine for only $5.00 (the cover price is $47.43 – that’s a savings of 89%). It’s auto-renewal, so this subscription will automatically renew until you decide to cancel it. The first print issue should arrive in 4-6 weeks. For current subscribers, subscriptions will be extended by 12 issues. Buy your $5 Woman’s Day subscription (& others) on Amazon.com today!